The recommendations appearing in this document should be regarded as a general guide only. The exact fertilization program should be determined according to the specific crop needs, soil and water conditions, and the grower’s experience. For detailed recommendations, consult a local Haifa representative. Disclaimer: Any use of the information given here is made at the reader’s sole risk. Haifa Chemicals Ltd. provides no warranty whatsoever for "Error Free" data, nor does it warrants the results that may be obtained from use of the provided data, or as to the accuracy, reliability or content of any information provided here. In no event will Haifa Chemicals Ltd. or its employees be liable for any damage or punitive damages arising out of the use of or inability to use the data included. It is highly recommended to perform a soil analysis before planting, and leaf tissue analysis during the growing season, to assess the fertilization requirements of rice in real-time. Soil tests for phosphorus (P), potassium (K), and zinc (Zn) (Table 6.1), and leaf tissue analysis for nitrogen (N), P, K, and Zn are valuable aids in developing efficient plant nutrition programs (Table 6.1). Field research has established the critical concentrations of P, K, and Zn in the soil by correlating soil test values of these mineral nutrients and rice plant performance. The presence of critical or subcritical values (Table 6.2) of a given nutrient will generally result in a reduction of 10% or more of growth and grain yield. When soil test values are near or below the critical level, application of the deficient nutrient will usually prevent this reduction. Therefore, proper soil sampling, chemical analysis and interpretation help avoid plant nutrient deficiencies and are valuable guides in soil fertility management. Whereas soil analysis provides insight to preplant fertilizer needs, plant tissue analysis is valuable as a way of diagnosing the nutritional status of the growing crop. Tissue analysis serves as a guide for mid-season N application and for anticipating the need for N, P, and K applications for subsequent rice crops. The value of tissue analysis depends on representative sampling, selection of the proper plant part, generally- the most recently matured whole leaf blade, also known as the “Y-leaf”, (Figure 6.1), drying and handling of samples, analytical procedure used, and the correct interpretation of the relationship between the nutrient levels and crop growth and yield. Figure 6.1: The "Y-leaf," the most recently fully expanded leaf of the rice plant, is the correct leaf to sample for tissue analysis. A single pre-flood application, where the entire N rate is applied at once. Such a treatment is not recommended for certain varieties, and under poor water management conditions. Split applications, whereby the total amount of N fertilizer can be split into three applications with an early N application of about 20-30 % of the total requirement. The remaining 70 to 80% is split into two applications based on the needs of the crop, as determined by leaf color by using the leaf color chart (Figure 6.3). Phosphorus fertilizer application timing of is a critical factor affecting the P nutritional status of the rice crop. P fertilizer should be applied pre-flood on P deficient soils, because P uptake for biomass production takes place during the entire growth season. As rice crop will remove 0.35 kg of P2O5 per 50 kg rice grain, the following application rates apply for soils testing between lower than 35 and over 55 kg/ha of P. These recommendations take into account the said removal factor. * In the event the soil test results in higher extractable P contents, Table 6.6 will provide more accurate recommendations. These recommendations are based on the assumption that the straw will be recycled into the soil after the harvest. However, if the straw is removed from the field, K2O requirements for a yield of 6.5 t/ha and of 5.5 t/ha are 153 and 121 kg/ha, respectively. Potassium application is recommended before rice shows K deficiency symptoms as only low yield benefit, if any, is obtained from K fertilizer application to deficient rice in the mid-to-late boot stage. K fertilizer added at this time probably has little benefit for the current rice crop, but will remain in the soil for the future crops. It is recommended to apply all potassium rates by broadcasting and incorporating before planting in both water-seeded and dry-seeded rice. If potassium fertilizers could not be applied pre-plant, they can be applied before establishing the permanent flood. Split application is also common in some areas. 6.3.1 What are Multicote™ and CoteN™? Multicote™ is a polymer-coated controlled release fertilizer that releases plant nutrients slowly and continuously throughout the crop growth cycle. Multicote™ is available in a wide range of formulas, and with release longevities of 2 to 16 months (at soil temperature of 21oC). CoteN™ is the most suitable polymer-coated controlled release fertilizer for rice since it is a polymer coated urea with 4-month release longevity. One base-dressing application ofCoteN™ enables avoiding top-dressing application and prevents nitrogen loses by leaching. Haifa produces a special non-floating CoteN™ for paddy rice (Figure 6.4). This special fertilizer is heavier than the regular CoteN™ which settles in the water on the flooded soil surface and will not be washed away with water current that may occur in a paddy field. It gradually releases available nitrogen to the rice plant. This controlled release procedure, prevents nitrogen loses and increases the uptake efficiency by the plant. CoteN™ is suitable for base-dressing application. Continuous release of nitrogen from the encapsulated urea, ensures the supply of nitrogen according to plant growth and developing needs. CoteN™ be applied as a part of the total recommended N, by blending it with the regular fertilizers or by using it as the sole source of the recommended nitrogen rate. Scientific research demonstrated that the continuous supply and reduced loses of nitrogen derived from CoteN™, enable a considerable reduction (20%) in the application rate of nitrogen. This will save on the fertilization costs and reduce the groundwater pollution. Non-floating CoteN™ is suitable especially when side-dressing is required. The higher specific weight of this special product will ensure that the product granules will remain on the bottom of the rice paddy and will continuously release nitrogen in accordance with the rate needed by the crop, preventing the need for a second top-dressing application. Foliar Feeding is a fast and highly effective method of supplementing and enriching plant nutrients when needed. Foliar application of Haifa Bonus water soluble fertilizer provides the exact composition of plant nutrients for optimal development of rice crop, when absorption of nutrients from the soil is disturbed. Precision-timed foliar sprays are a fast-acting and effective method for treating nutrient deficiencies. Haifa Bonus, a high-K foliar fertilizer contains a special adjuvant, which improves the adhesion of the fertilizer to the leaf surface and creates fertilizer clusters that release nutrients over a prolonged period of time. 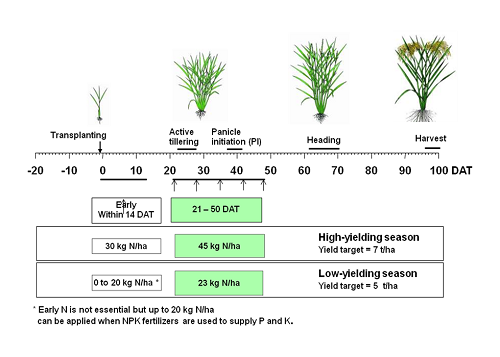 Foliar application of the correct Haifa Bonus nutrients, in relatively low concentrations at critical rice development stages, contributes significantly to higher yields and improved quality. Haifa Bonus fertilizers are available in various N-P-K-Mg-Zn ratios. The fully water soluble high K and chloride-free fertilizer, is suitable for rice crop wherever it is grown. Careful soil- and leaf analyses will help selecting the optimal Haifa Bonus formula. 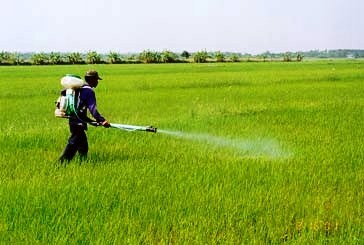 To verify the safe rate under local conditions, it is advisable to spray recommended rate of Haifa Bonus on a few rice plants then, 3 to 4 days later, check the treated rice plants for scorching symptoms. Dissolve the entire required Haifa Bonus massin water, at about double of the Haifa Bonus mass. Add this solution to the spray tank when it is half full with water. When tank-mixing with crop-protection agents, addition of wetting agents is not necessary. To ensure inter-compatibility of the two (or more) tank-mix components, a small-scale spray test should be performed on few rice plans several days prior to the commercial application. ** 4 – 5 sprayers of 8 liter/sprayer per 1000 m2 will deliver 320 - 400 liters/ha. *** 2 – 3 sprayers of 16 liter/sprayer per 1000 m2 will deliver 320 - 480 liters/ha. Usually, no compatibility problems should be expected while tank-mixing Haifa Bonus with fungicides and with insecticides, but hydrolysis may occur with dimethoate as it may break down, at pH 8 or higher, in one hour or less. Thus, a pH range of 5-6 should be maintained. Due to the fast action of Haifa Bonus,it is recommended to apply when the rice plant needs the boost of the nutrients. After numerous experiments all over the world (see chapter 5, it is fully established that spraying Haifa Bonus should take place two or three times during active growth season, at 2% or 3% (w/v) spray concentrations. Two weeks after panicle initiation (frequently 75 DAS for 90 - 100 day varieties). When spraying Haifa Bonus+Zn,application 5-10 days earlier is advocated. As shown in chapter 2.8.2 spraying Haifa Bonus can markedly reduce yield loss due to lodging. 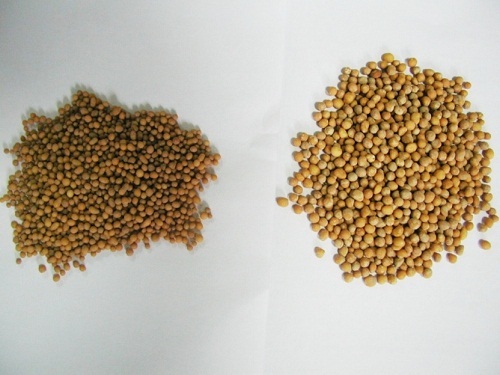 In situations of lodging (lodging-sensitive varieties and over application of nitrogen), two sprays of Haifa Bonusat 2-3% in 300-350 L/ha each, 15 days apart, are recommended, starting at tillering stage. If a soil test prior to planting indicates a Zn deficiency, apply 8 to 11 kg of Zn in the form of 20-35 kg/ha of Zinc Sulfate. In the dry-seeded system, soil-applied zinc should be broadcast and shallow incorporated no more than 2.5-5 cm deep, in order to avail it to the seedlings. If deficiency symptoms show after rice emergence, apply foliar sprays of Haifa Bonus+Zn at 1-3 % solution at 30, 45 and 60 days after planting. It can be tank-mixed with propanil, if the propanil is needed, for weed control or with any other pesticide.